October 1, 2013 marks our three year anniversary! 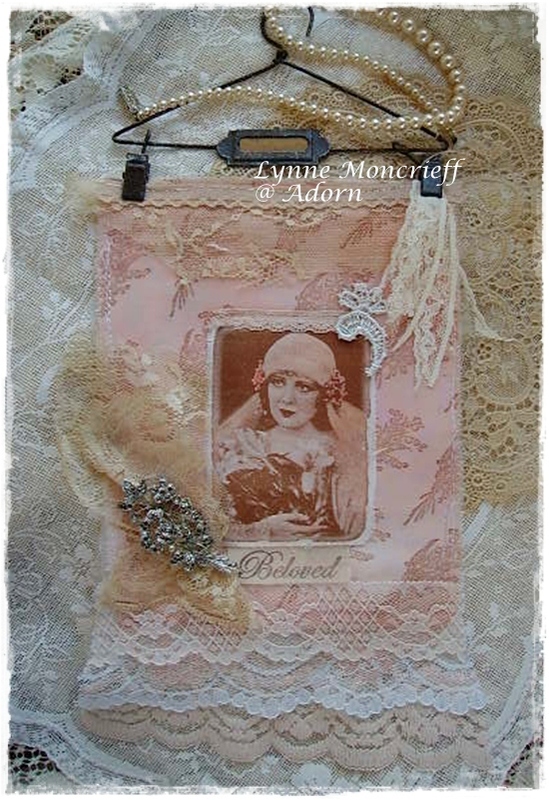 Can you believe that it was back on October 1, 2010 when we posted our first challenge? We have seen the most beautiful entries over the years and we would like to thank our faithful players who have amazed us again and again! Thank you to everyone who linked up projects in September; your work is as fabulous as ever! 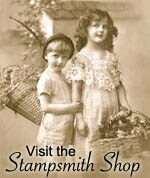 Congratulations to Hellerlittle who has been drawn as our anniversary winner of a $21 gift certificate to The Stampsmith Store! Please contact Valerie for all of the details (her link is in the sidebar). 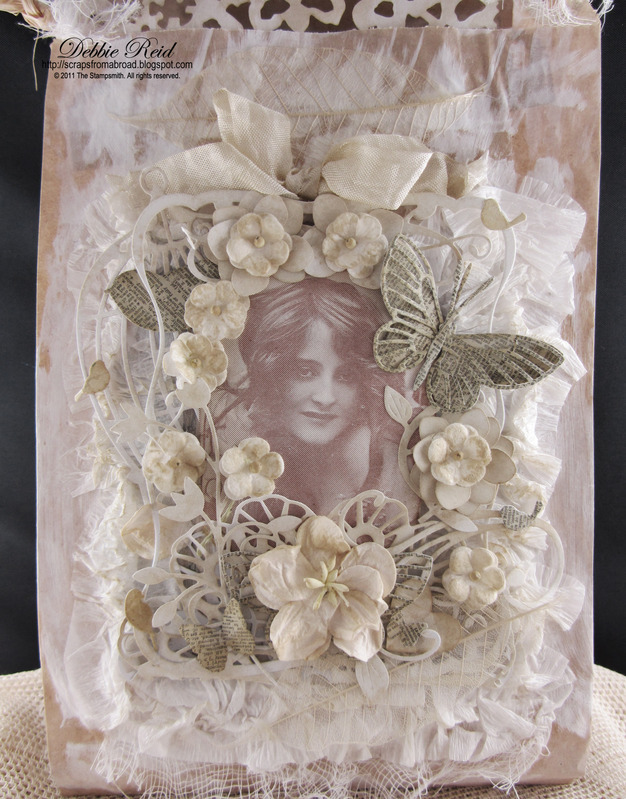 Below is a close up of Hellerlittle's beautiful project. 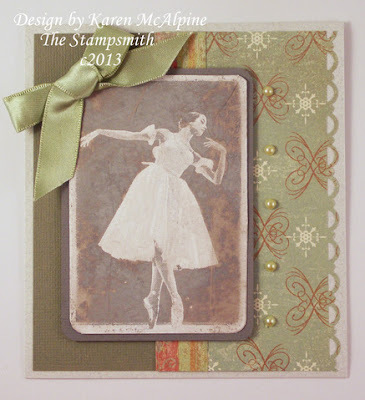 You can visit the Stampsmith Design Team Blog for even more Stampsmith inspiration! 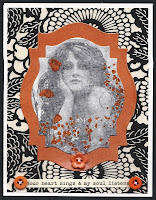 This fall, we have the amazing Maria Green visiting as a Guest Designer... do drop by and send her some love! We look forward to hosting more challenges in the future. 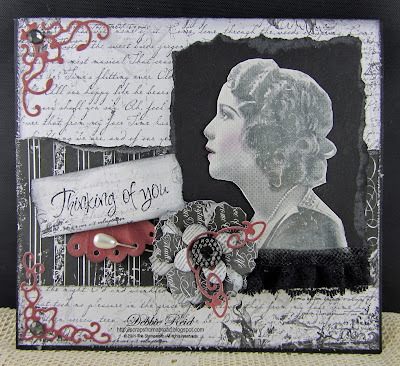 This month, Stampsmith is very excited to welcome another fabulous guest designer, Maria Green (aka Maz)! 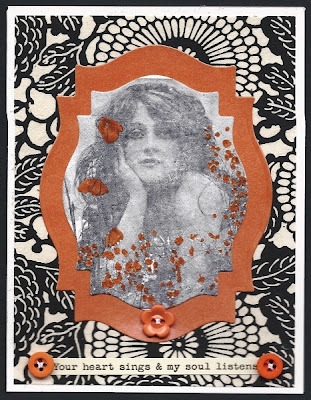 Be on the lookout for more of Maria's beautiful work on the Stampsmith Designer's Blog as she joins our designers during September, October and November. 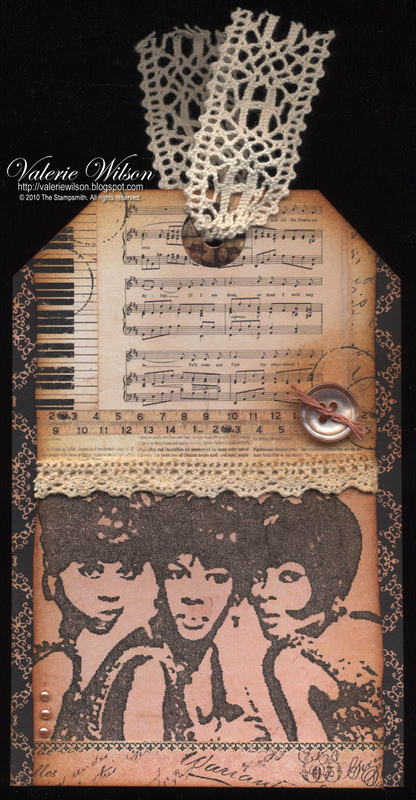 For this special challenge, Maria has asked us to use a song as our inspiration - your project doesn't have to represent the song, just be inspired by it! We can't wait to see what you create! 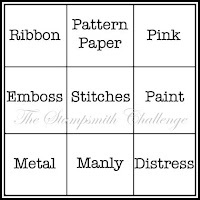 Be sure to play along for your chance to win $21 toward your choice of Stampsmith stamps! 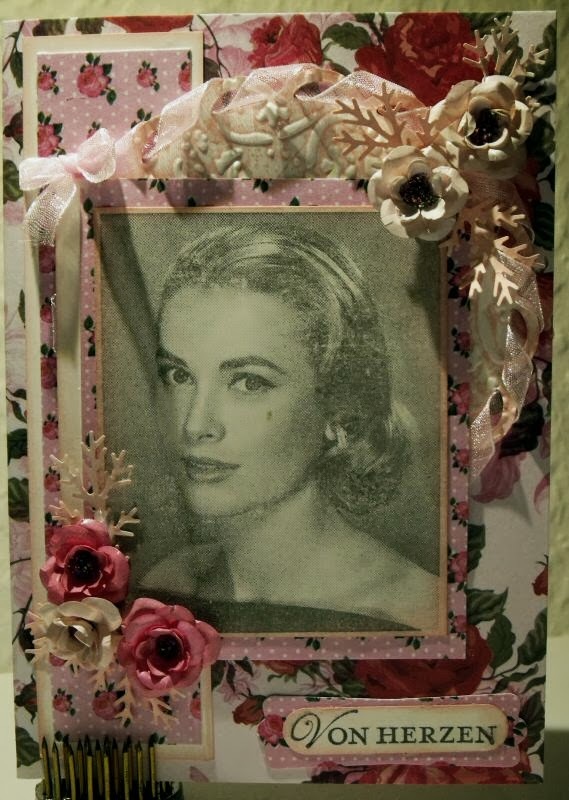 Ladies, your Vintage projects for July were just fabulous! We love how you all approached this theme from different angles - outstanding work!! 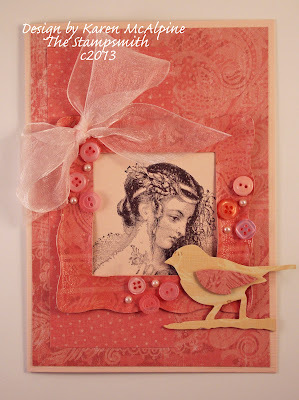 We thought it would be fun to highlight one stamp used two different ways this month! 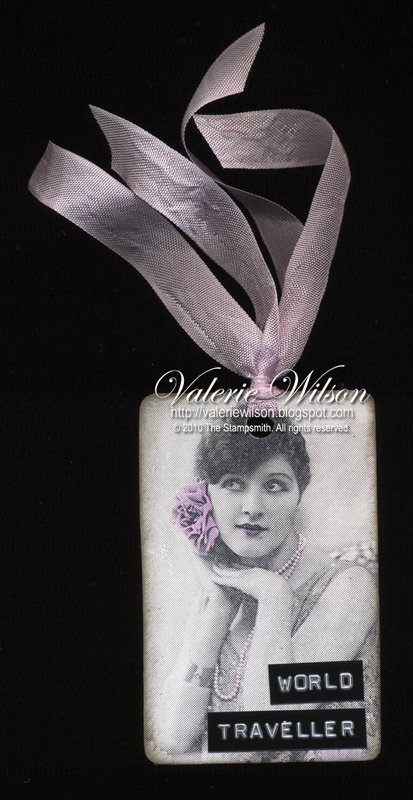 Ladies, if you would like our special 'featured' badge for your blog, please contact Valerie (her link is in the sidebar). Congratulations to Katie K. who has been drawn as this month's winner of a $21 gift certificate to The Stampsmith Store! Please contact Valerie for all of the details (her link is in the sidebar). As it happens, Katie also used Ophelia this month, so this makes one stamp used three ways! 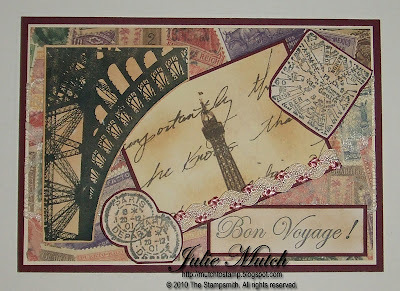 This month's challenge theme is World Traveller. Whether it's a spontaneous vacation abroad or a well-planned world tour, travel is always an adventure! We hope you'll use one of your best travel stories as inspiration for this month's project and join the Stampsmith Challenge for a chance to win $21 towards your favourite Stampsmith stamps! Here is some travel inspiration from our design team to get you started! 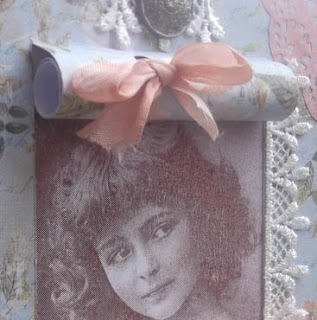 And a little reminder to visit the Designer's Blog for more of the design team's beautiful work as well as gorgeous inspiration from our fabulous guest designer, Paula Tidman. 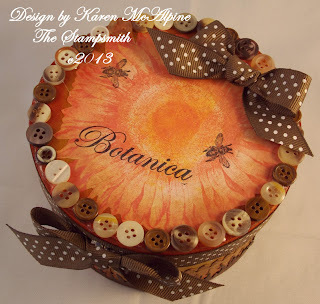 A special thank you to the gorgeous gals who altered a box, bag or book for the June challenge and congratulations to Barbara Washington who has been drawn as this month's winner of a $21 gift certificate to The Stampsmith Store! Please contact Valerie for all of the details (her link is in the sidebar). 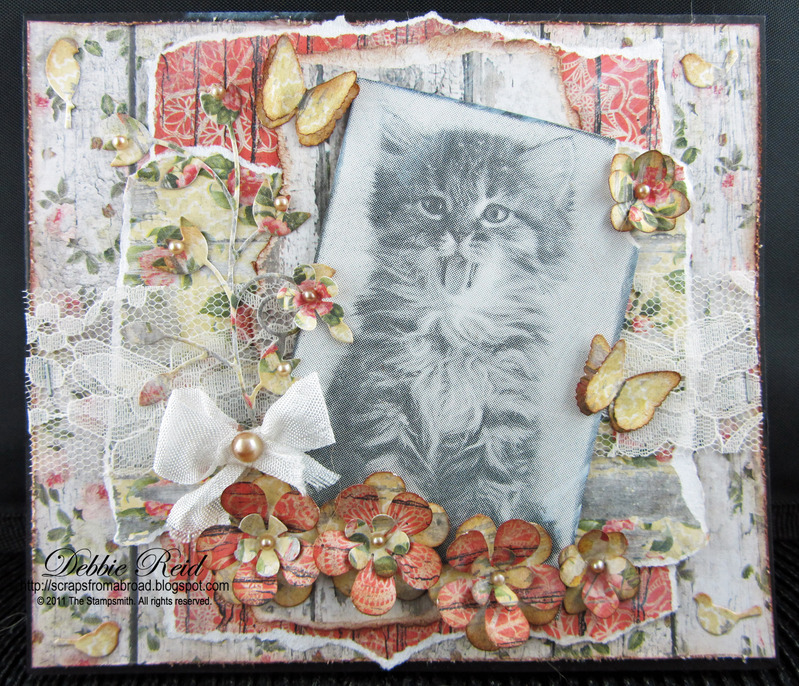 Shabby Chic or Vintage Grunge is the July challenge theme selected by our fabulous guest designer, Paula Tidman. Both very popular styles and perfect for showcasing your Stampsmith favourites. 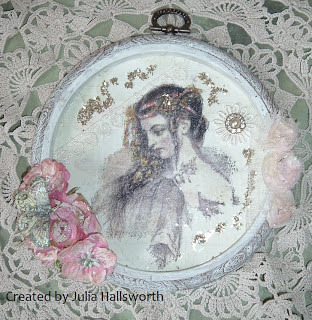 We'd love you to play along and share your projects with us this month. 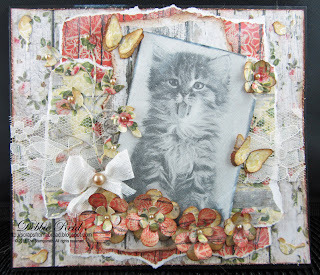 So choose your preferred style `Shabby or Grunge' and join the Stampsmith Challenge with a chance to win $21 of gorgeous stamps of your choice from The Stampsmith. Here is some stunning inspriation from our special guest and the Stampsmith design team! Thank you to everyone who played along with our very first Tic Tac Toe challenge theme in May. We were thrilled to see your work and welcome some new players! Here are just a couple of the stunning highlights. Ladies, if you would like our special 'featured' badge for your blog, please contact Valerie (her link is in the sidebar). Congratulations to Sue at Stamping Sue's Blog who has been drawn as this month's winner of a $21 gift certificate to The Stampsmith Store! Please contact Valerie for all of the details (her link is in the sidebar). 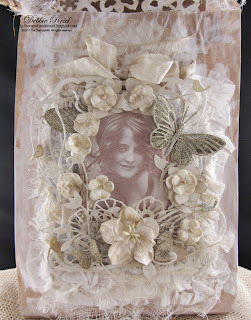 Here's Sue's project for a closer look! 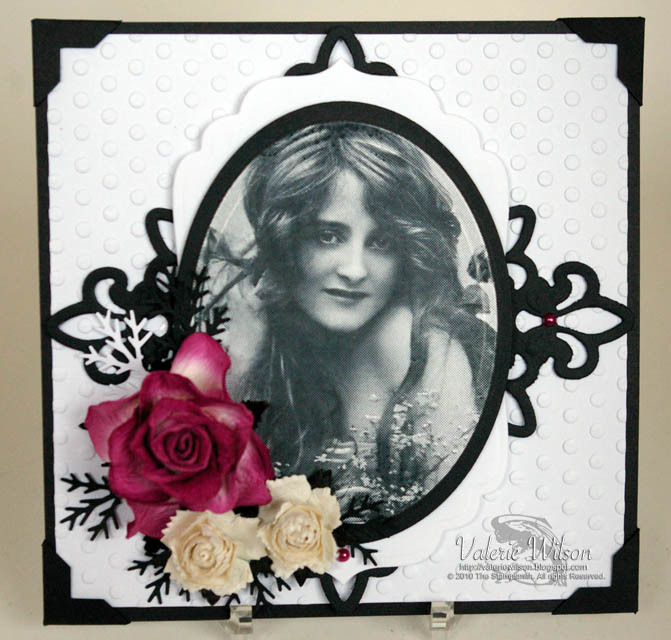 This month's theme was selected by none other than our very first guest artist, Paula Tidman! 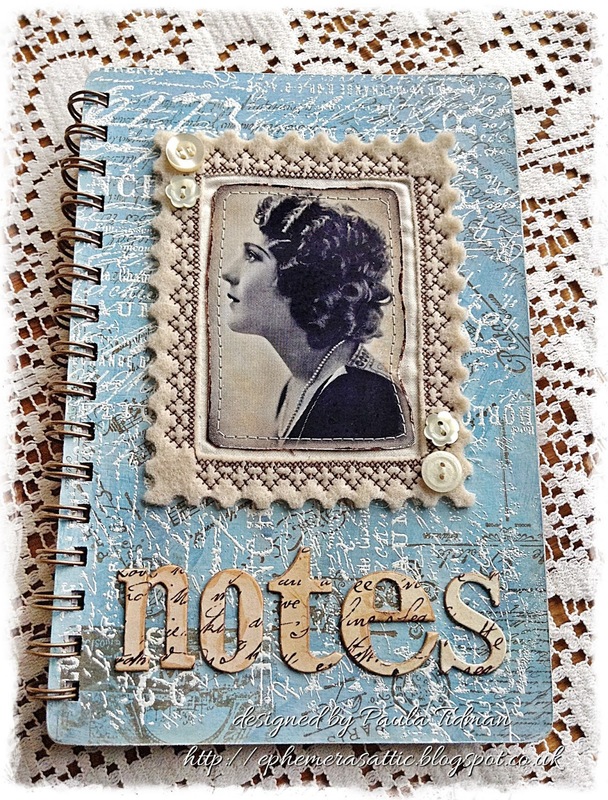 (Be on the lookout for Paula's beautiful work on the Stampsmith Designer's Blog during June, July and August!) 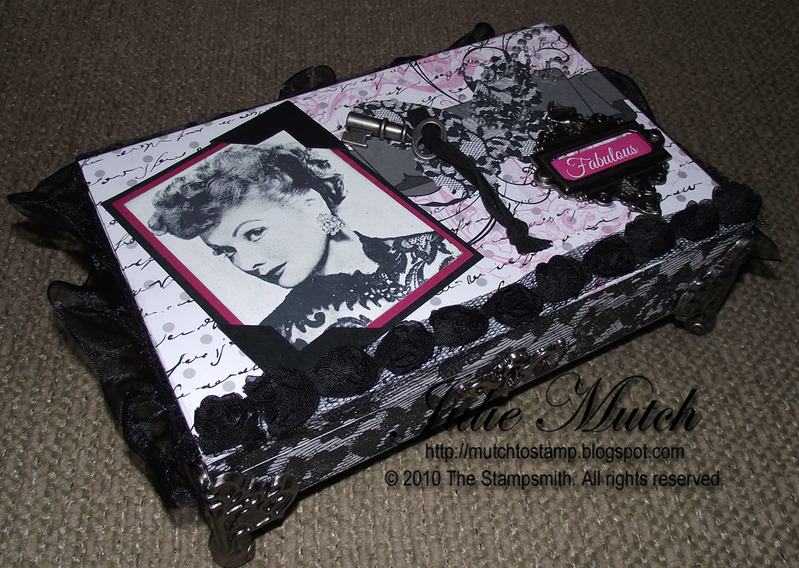 Paula would like to see us altering boxes, bags and books to give them a second lease on life with a creative twist! We hope you'll invite a friend or two to play along for your chance to win $21 toward your choice of Stampsmith stamps! We have thoroughly enjoyed your black and white projects with a splash of color! Here is a closer look at just a couple of your gorgeous projects! 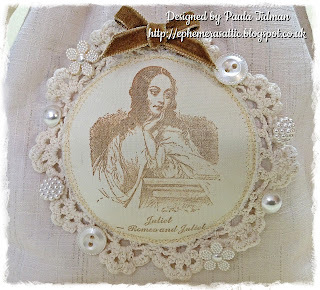 Ladies, if you would like our special 'featured' badge for your blog, please contact Valerie (her link is in the sidebar). 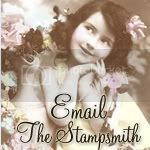 Congratulations to Darlene at Dar's Blog who has been drawn as this month's winner of a $21 gift certificate to The Stampsmith Store! 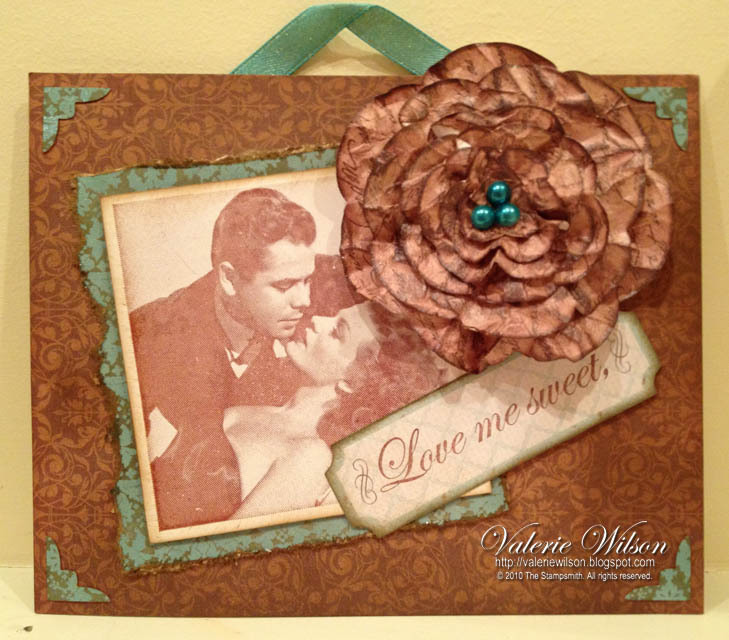 Please contact Valerie for all of the details (her link is in the sidebar). 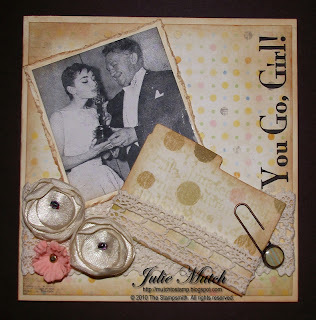 Tic Tac Toe - Using At Least One Stampsmith Stamp - Plus an Announcement!! In March, we asked for challenge theme suggestions and you sure came through!! This month we feature our first Tic Tac Toe challenge as suggested by Alison! Thank you, Alison! To play along, just choose any straight line across our Tic Tac Toe board, below. Then create your project using the three items along your straight line! 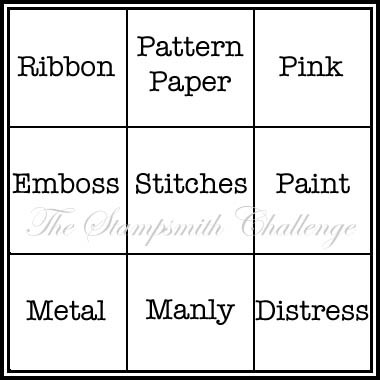 We hope you'll invite a friend or two to play along for your chance to win $21 toward your choice of Stampsmith stamps! And before we reveal our Design Team inspiration for this project, we would like to congratulate Paula Tidman (aka Ephemera) on being selected as our very first Guest Designer! 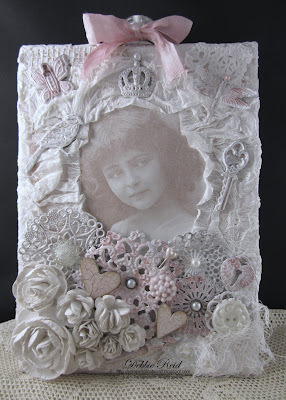 Paula will be sharing her gorgeous projects with us throughout June, July and August! 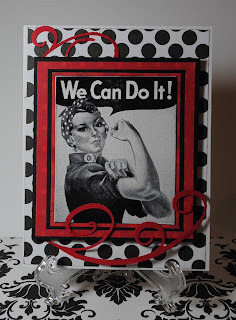 We know you will be as inspired by her work as we are! 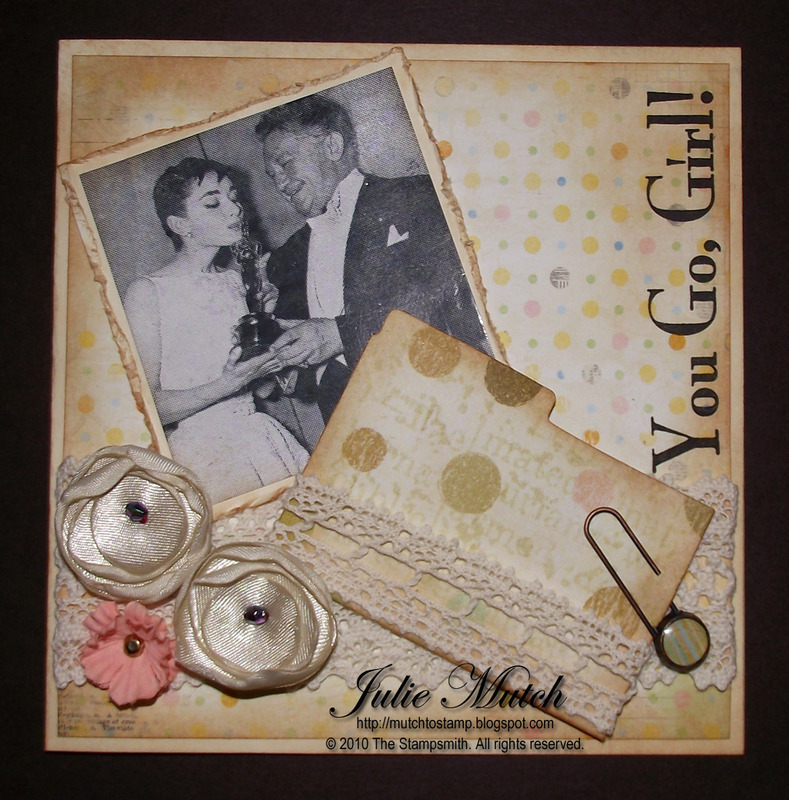 Speaking of inspiration.... the design team has shared some wonderful projects to get you started with this month's Tic Tac Toe challenge! Thank you to everyone who submitted projects and theme ideas to this month's end of winter challenge! Since we have just a few delicious entries for our Spring theme, we are able to highlight one brilliant aspect of each wonderful project! 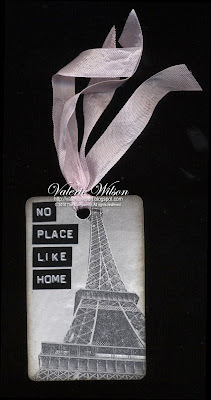 Ladies, if you would like our special 'featured' badge for your blog, please contact Valerie (her link is in the sidebar). The layering of paper, stamp, doily, image and beautiful flowers creates a real depth of interest. 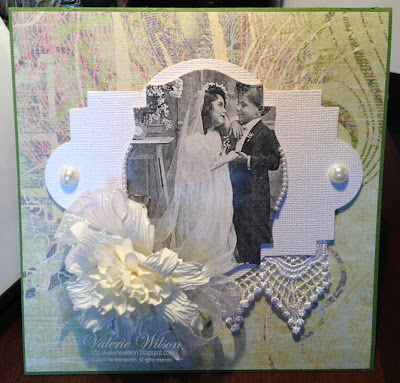 Criss-crossing sheer ribbon adds a unique backdrop for the gorgeous rolled flowers. 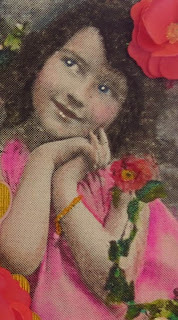 Watercolor pencils add cheerful colors to the darling photo-realistic stamped image. A tied roll of paper adds an unexpected dimension and drama to this dreamy decor. 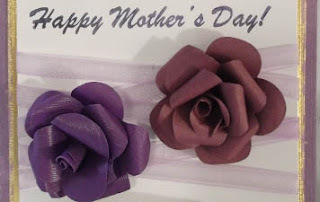 Congratulations to Marilyn at Crafts And Beyond who has been drawn as this month's winner of a $21 gift certificate to The Stampsmith Store! Please contact Valerie for all of the details (her link is in the sidebar). Thank you to Alison who left a theme suggestion for a Tic Tack Toe Challenge. 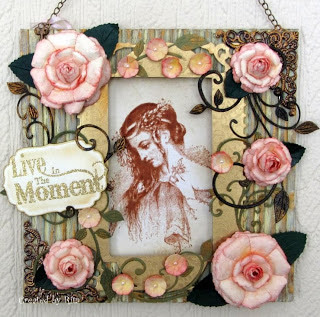 Great idea - we've never done one here before! 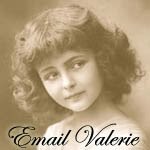 Please contact Valerie with your snail mail address so she can send you a wee bit-o-love (her link is in the sidebar). Barbara Washington made the first theme suggestion of Black and White with a Splash of Color in the comments last month, so we ran with it! Thank you, Barbara! 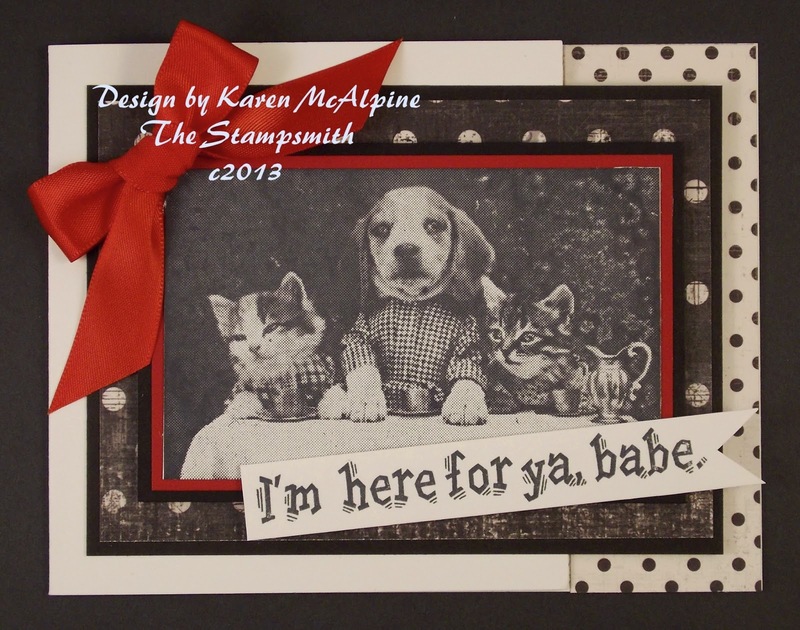 :) We hope you'll invite a friend and play along for your chance to win $21 toward your choice of Stampsmith stamps! Our fabulous designers have been splashing each other with color already! LOL! 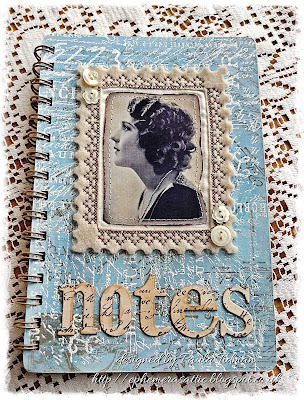 Here are their wonderful creations for inspiration to get you started this month! 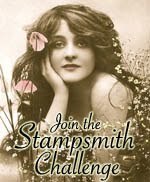 A new Stampsmith challenge theme begins on the 1st of every month. We will draw one winner at the end of every month. 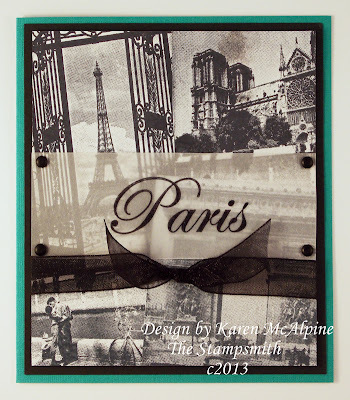 The winner will receive a gift certificate valued at $21 for the Stampsmith Store! 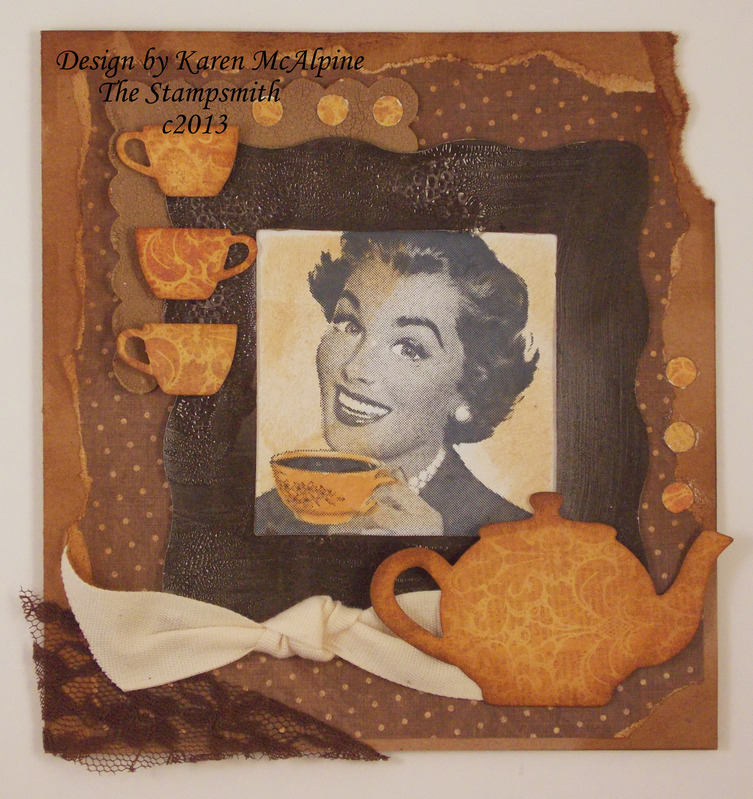 Projects including at least one Stampsmith image will be eligible to win. 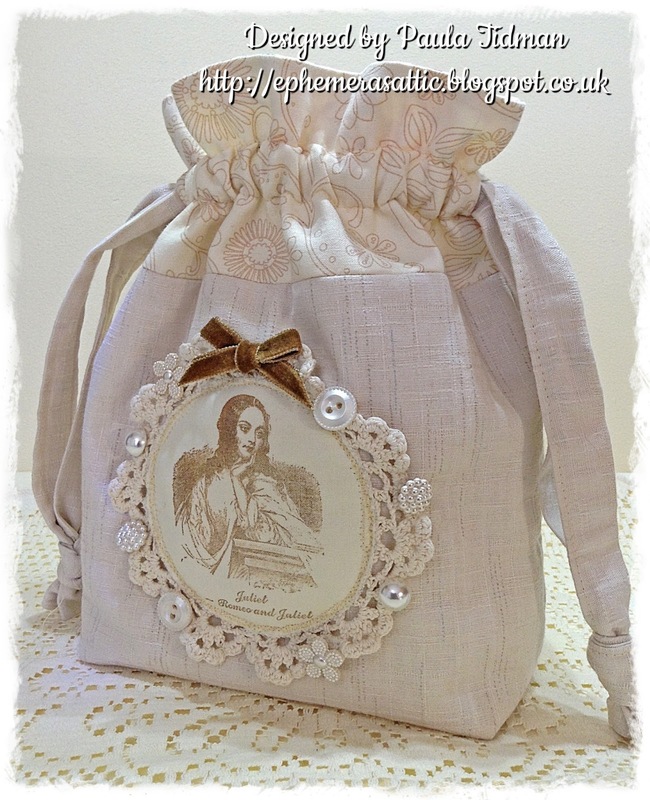 Please link directly to your entry, not just to your blog. You may enter a challenge more than once as long as each submission is linked to separate blog posts. 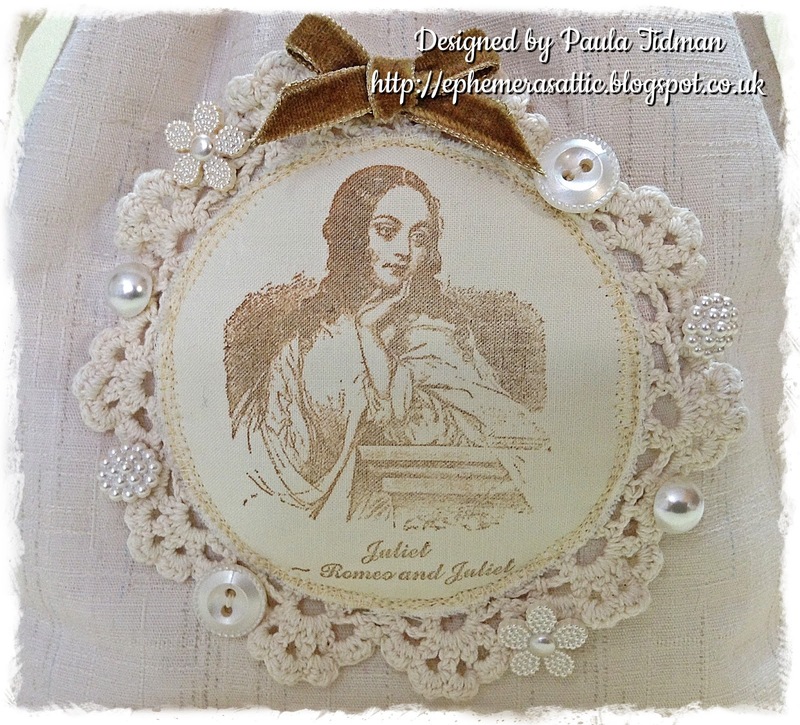 We encourage you to visit each other's blogs and leave a comment, it means a lot! Please note, if there are less than 5 entries in a month, we will add those players to the draw for the following month instead of making a draw. Q: How do you get such a crisp photo-realistic image? 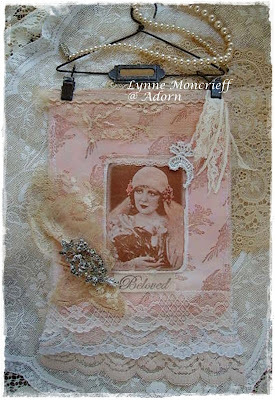 A: Use glossy card stock and dye ink by Clearsnap (either Ancient Page or Color Box Archival Dye Ink - the new replacement for Ancient Page). 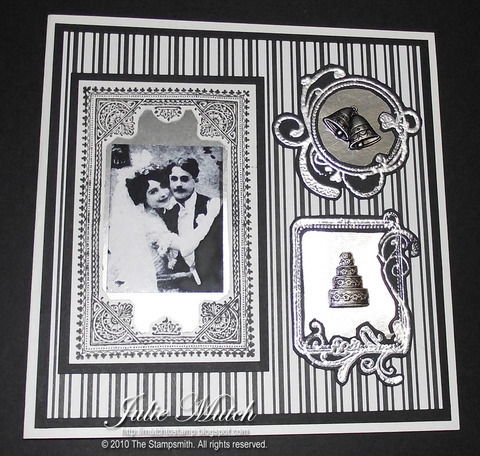 Stamp onto a foam rubber stamping mat with heavy, even pressure. 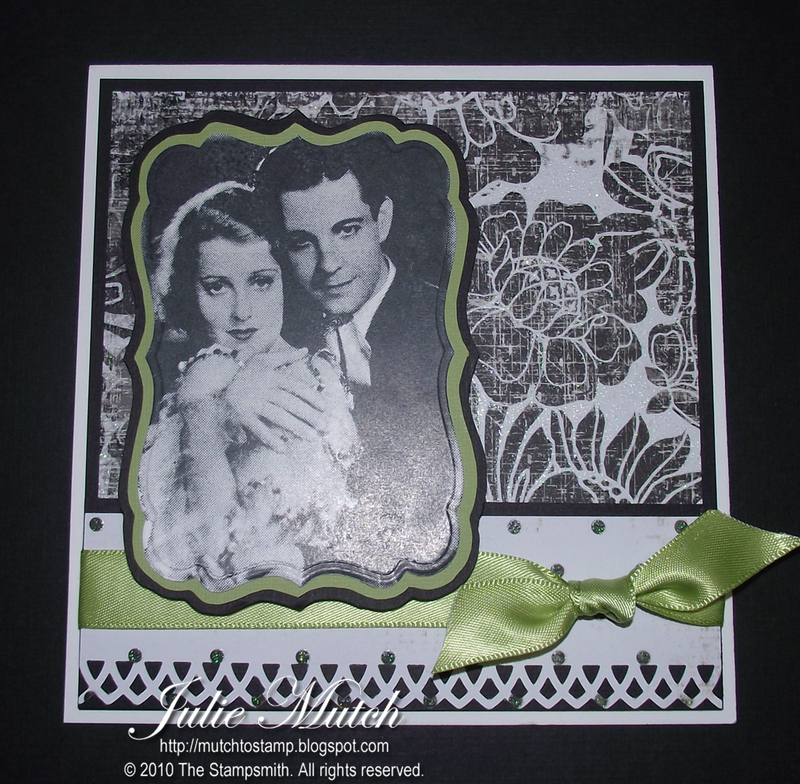 Let the stamp sit on the paper for 20 seconds after stamping it so the ink absorbs. 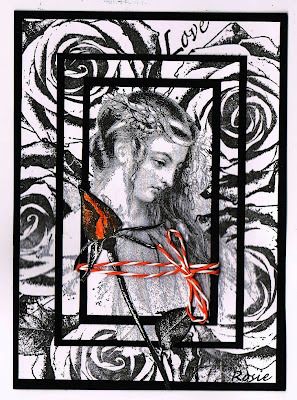 Peel the stamp off gently while holding the paper down. link to us in your sidebar. Check out the Design Team Blog! 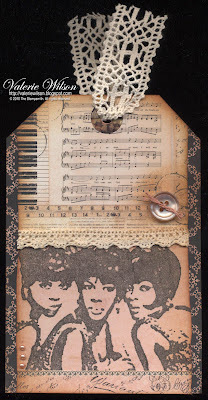 Featuring additional stamps, an inspirational member gallery, tips and hints, new release previews and sale details. 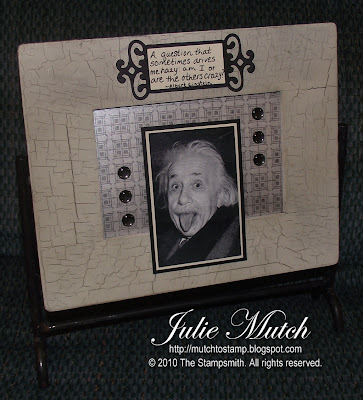 Enter your Stampsmith creations in other challenges!